Up to 100 turkeys that survived the cull and still live at the South Beach Psychiatric Center will be relocated next month to a farm in upstate Greene County. 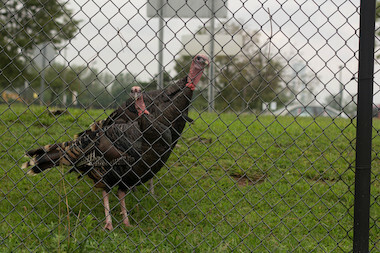 OCEAN BREEZE — The Staten Island turkeys will get a pardon after Thanksgiving this year. Up to 100 turkeys that live on the grounds of the South Beach Psychiatric Center will be collected and relocated next month to a private farm in Greene County, New York, according to the state's Office of Mental Health. The state Department of Environmental Conservation issued a permit to the U.S. Department of Agriculture to relocate the birds starting in early December, a spokesman for OMH said. Assemblywoman Nicole Malliotakis, who joined other politicians to issue a public plea to move the flock rather than cull it in April, said it took longer then expected but she was happy the fowl will live to see another day. "It took longer than it would be expected for a situation as simple as relocating turkeys and I'm happy that we have a resolution," she said. "Hopefully it will at least relieve the problem a while." After the farmer agreed to take in the flock, he had to install fencing, a shelter and access to water before the state gave the OK to receive the turkeys, Malliotakis said. "There seems to be lots of obstacles along the way because the DEC has all sorts of regulations and requirements," she said. The owner of the farm is a licensed game bird breeder with the DEC and requested anonymity, the spokesman for OMH said. Malliotakis estimated that the majority of turkeys that live on the grounds will have space to be brought to the new farm. Last year, the USDA began a controversial $16,000 cull of the turkeys at the center. Residents and elected officials protested the round-up and, eventually, 28 of the birds were sent to an animal sanctuary upstate. The original cull was started after staff complained about the turkey's aggressive behavior, health concerns about their droppings and traffic issues from them crossing the street. The DEC had previously tried several methods to curb the birds who live on the grounds before the cull, and had ruled out relocating them because it was a hybrid flock — a mix of domestic and wild turkeys.